More than 500 graduands will robe up to receive formal recognition of the successful completion of their studies at Charles Darwin University’s (CDU) mid-year graduation ceremony this week. More than 2100 students will officially graduate as a part of the ceremony which recognises the academic achievements of students from both the higher education and vocational education and training sectors. The mid-year graduation ceremony, to be held on Thursday 20 and Friday 21 May, will take place at CDU’s Casuarina campus. A total of ten PhDs and two Honorary Doctorates will be awarded over the two nights. Former Social Justice Commissioner, Tom Calma and long serving local doctor, Dr Sadhana Mahajani will be recognised for their respective contributions to the Northern Territory with Honorary Doctorates. CDU Deputy Chancellor, Richard Ryan will deliver the Occasional Address, while Paul Neeraj and Craig Zwetsloot will provide the students’ responses. The ceremony will begin at 6pm on both evenings. 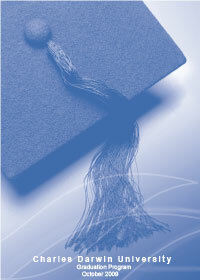 For further information about graduation, contact Graduation Administrator Lisa-Marie Stones on 8946 7245.